Loose Brackets - Weekly Cooking Tips! A poor man's sea bass. Sardines to me taste anything but like sea bass. When fishing season slows down from the town where I live, sardine is the next best thing. Nonetheless, there's hope for this beloved delicacy. 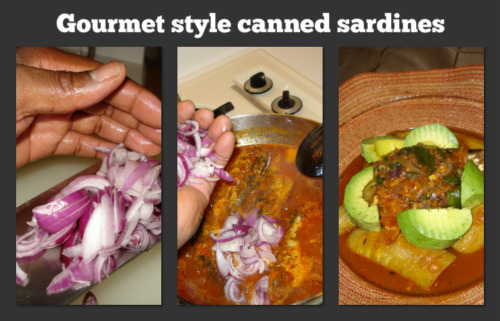 With or without tomato sauce in that sardine can, an attractive dish can be accomplished only if you're passionate food and how you feed family and friends. Since the fish is already cooked from the can, there isn't much to do except to add your own style to it. Once you got some fresh crushed garlic stir fried into a hot pan with olive oil, add the fish and its juice in that pan with medium low fire under it. Depending on taste, it's ok to add some fresh parsley, thyme, basil or dried oregano if desired. For a finishing touch, instead of ONIONS I prefer using RED PEARL ONIONS; they look like mini red onions and they're packed with flavor. Take a few not too many and chop to a desired thickness but not too fine. Add them last then turn off the fire. My special treat is to serve all the above with fresh spinach and avocado slices, it's as good as having a SUNDAY with cherry on top. Fresh of dry, this herb can add life to a boring dish. With every herbs and spices ofcourse, moderation is a must. Too much of this tuff, your food will taste like dirt, but will smell great. Therefore, my suggestion is to add a pinch of this herb 1 -2 minutes before concluding cooking the sauce, fish, beef, lamb or even rice at times. Please keep in mind the quantity of food being cooked in order to moderately add the right amount. Thyme makes my red snapper and black bass fish taste GREAT! If you stir fry some really crispy, you can use on a sandwich, salad, pasta or ice cream as a topping. If you treat turkey bacon nice, it'll do you justice. Overall, it's packed with flavor and better for your health. I love mine on pasta and sometimes eggs, depending on how I feel.